We have a brand new song for you from Shaad Ali’s Soorma. The soulful track titled ‘Pardesiya’ composed by Shankar Ehsaan and Loy and penned by the legendary Gulzar is emotional and inspiring in equal measure. 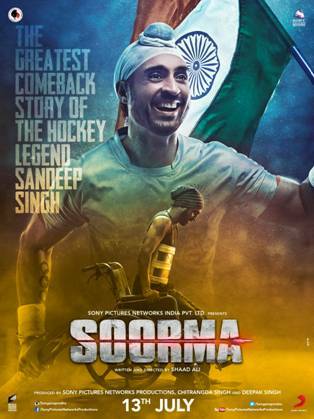 Soorma, which releases in cinemas this Friday, July 13th, narrates the story of hockey player Sandeep Singh who was paralysed after an accidental gunshot in 2006. He struggled and battled with his paralysis making a comeback to international hockey in the year 2008 and it was under his captaincy, that India won the 2009 Sultan Azlan Shah Cup and also qualified for the 2012 Olympics. In the video, which will bring you to tears, audiences see actor Diljit Dosanjh alongside his co-star Taapsee Pannu, who plays Harpreet, going through his injury and then getting back to his feet. Emotional, moving and more… it is incredible.